Tricky golf for the novice golfer. Many obstacles and traps to provide a rigorous test- large bunkers and sand/gravel areas as well as challenging water. The course is very built up so there is always the possibility of ruining someone’s BBQ or newly fitted windows. 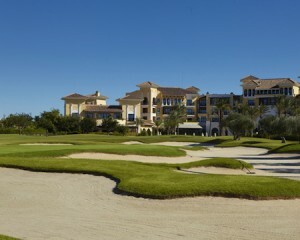 Nicklaus has made a good 9hole space of DT a really strong 18 hole PGA Resort Course!